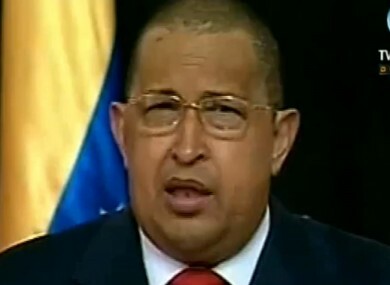 The Venezuelan leader underwent surgery on a tumour in June. VENEZUELAN PRESIDENT HUGO Chavez has asked legislators for permission to return to Cuba to undergo a second round of chemotherapy for his cancer. In June, he underwent surgery in Cuba for a tumour in his pelvic region, but he has not said what kind of cancer was found. Earlier this week he appeared on Venezuelan television with his head shaved. The National Assembly’s secretariat is to hold a special session today to vote on him leaving. Chavez (57) said he would undergo medical tests in Cuba tomorrow and Monday and there was “no complication in the process”. Although he admitted he would have to lower his public profile a little, Chavez said he had no plans to withdraw from the public eye while undergoing chemotherapy. In fact, he has been very active on Twitter, which has enabled him to govern remotely while undergoing treatment. Email “Chavez to return to Cuba for chemotherapy”. Feedback on “Chavez to return to Cuba for chemotherapy”.